Amazon has said it may conduct more of its drone research outside the US because of strict regulation of the unmanned aircraft. The firm has been waiting since July for approval from the Federal Aviation Administration (FAA) to test drones near Seattle, reports Reuters. 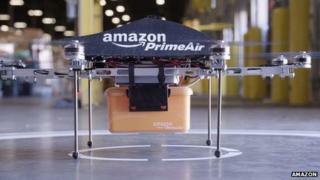 Amazon announced proposals for a drone delivery service called Amazon Prime Air in December 2013. The FAA has been contacted by the BBC for comment. "Without approval of our testing in the United States, we will be forced to continue expanding our Prime Air R&D footprint abroad," wrote Paul Misener, Amazon's vice president of global public policy, in a letter to the FAA. Amazon wants to use small drones to deliver packages up to 2.3kg (5lb) in weight. The service would enable customers to receive a purchase within 30 minutes of placing an order. Six drone operators were approved by the US to carry out commercial flight tests at around the same time as Prime Air was announced but Amazon was not among them. Successful applicants included the University of Alaska, Griffiss International Airport in New York and North Dakota's Department of Commerce. The FAA said it considered "geography, climate, location of ground infrastructure, research needs, airspace use, safety, aviation experience and risk" in selecting the operators. Amazon already has a drone R&D lab in Cambridge in the UK. Google and DHL are also exploring the use of drones as couriers. During the summer, Google demonstrated its service using a fixed-wing craft and in September DHL started a regular drone-delivery service to an island in the North Sea.